What Happens If a Medical Error Trumps a Personal Injury Case? Many personal injury case result in a trip to the emergency room or to a doctor. We trust medical professionals to address our injuries safely and effectively, but, unfortunately, that does not always happen. 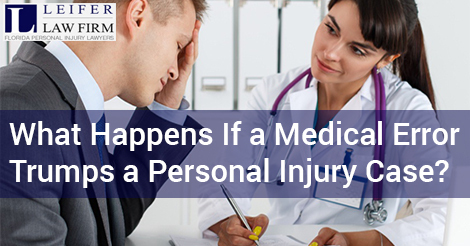 You may wonder what would happen in a situation where your personal injury doctor makes your injuries worse. What does this do to your personal injury claim? Do you have a new claim against the doctor? It depends. Read on to learn more about how a personal injury lawyer can help answer these questions and more about your unique case. Personal Injury and Medical Malpractice: Who is Liable? Personal injury case involves a wide range of injuries, from broken bones to permanent impairments. These conditions often require medical treatment. All of these can result in very serious injuries. So what happens when your doctor or treating medical professional actually makes your condition worse instead of helping you heal? If someone is at fault for your injuries, then they are at fault for ALL of your injuries. That includes situations where an unfortunate accident or situation makes your injury worse than it was initially. Your personal medical conditions: You might a condition that makes your injury worse that it would be for those that do not have the same type of condition. Hemophilia is a good example of this, but it could also include simple things like an allergic reaction to medication. Accidents that occur after the initial accident: Riding in an ambulance is dangerous in itself. If you are involved in a car accident while being transported to the hospital after the initial accident, then those additional injuries could go back on the original person at fault as well. Medical malpractice: When you head to the hospital, you put your life and limb in the hands of medical professionals. If the medical team does not do their job properly, then the party found at fault could end up taking the blame. Learn more about medical malpractice here. The Rule itself really refers to the plaintiff him or herself—it does not matter what conditions you may have that make your injury unique; the defendant is responsible for all of them. However, the Eggshell Skull Rule is also a good way to think of additional events that may happen after the accidents. The conditions of the plaintiff do not have to be foreseeable, but the events after the accident must be foreseeable. Consider our medical malpractice example. Medical mistakes occur in staggeringly high numbers. In fact, they may be responsible for up to 98,000 deaths per year. Therefore, it is foreseeable that a medical mistake could occur that would make your condition worse. There are actually very few situations that are not foreseeable when it comes to this type of rule. Nonetheless, strange occurrences do happen. For example, if an earthquake occurs while you are being transported to the hospital, the Court may or may not hold the original defendant liable. In this type of situation, however, it is far less likely because an earthquake is generally considered something that is not foreseeable. Each case is different, so it is important to speak with a Boca Raton personal injury lawyer about the specific circumstances of your case. Visit here to get started with a personal injury lawyer in Boca Raton today.